Image © Independent Film Company, 2013. Used by permission. 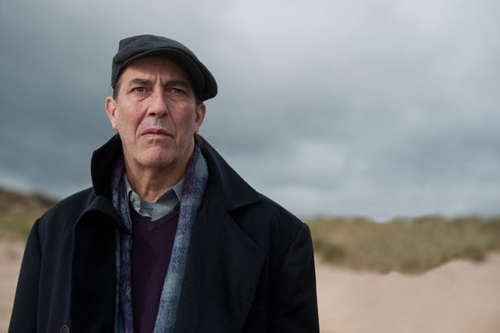 Art historian Max (Ciarán Hinds) is grieving after the recent loss of his wife, Anna (Sinéad Cusack), to cancer. Against the advice of his daughter Clare (Ruth Bradley), he goes to stay in a boarding house on the Wexford coast for a time while he tries to make progress on a book he has been struggling to write. It’s a place full of both joyful and painful memories of a childhood summer, and Max seems to think that revisiting them will help him process the bittersweet memories of his wife. 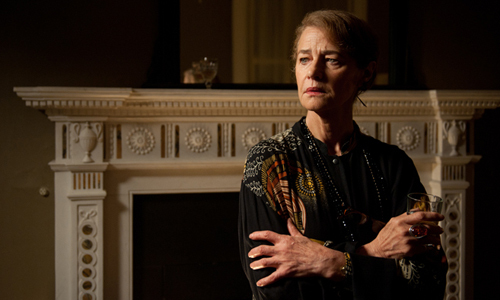 Clare is sure that it’s a ridiculous idea because ‘The past is the past.’ The Cedars boarding house is run by Miss Vavasour (Charlotte Rampling) and has just one other resident, the elderly Colonel Blunden (Karl Johnson) who quickly gets on Max’s brittle nerves. Like Max, Miss Vavasour also has a connection to that fateful summer of five decades previously, and clearly knew the Grace family who owned the house. A series of flashbacks replay moments in Max and Anna’s marriage and her final months after being diagnosed with terminal cancer. Anna, a photographer, and Max had quite different personalities, but the tensions in their marriage are more hinted at than spelt out clearly. Anna had a much brighter, more open disposition than Max. While he was preoccupied with writing about artists, she was one. While he investigated the past, she was busy capturing the present. While he was brooding about the exact nature of her relationship with another man, she was just getting on with enjoying herself. Nevertheless, the love between them was real, and Max has a very hard time watching Anna’s health failing. Fine performances by Hinds and Cusack make these scenes the most emotionally powerful of the film. As he returns to locations where he first encountered the Graces, the more distant past comes flooding back. A second series of flashbacks reveal how intoxicated he was by the family from the moment he first saw them on the beach. 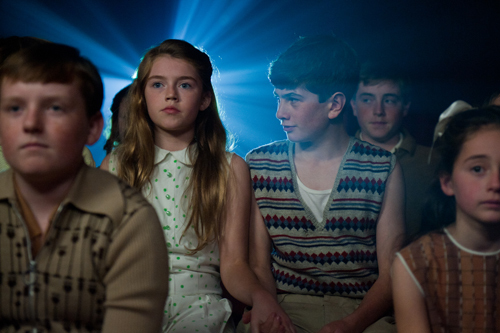 Carlo (Rufus Sewell) and Connie (Natascha McElhone), and their children, Chloë (Missy Keating) and her mute twin brother Myles (Padhraigh Parkinson), were different from his own family in almost every way. While his family was restrained, conventional and not well off, the Graces were exuberant, bohemian and affluent. As he fell under their spell, he became infatuated with Connie and then with Chloë before becoming aware of some disturbing currents under the surface, which have tragic consequences. It is entirely understandable that Max should feel lost and alone, surrounded by things that bring back so many memories. Some time away from it all could seem very attractive, but Max evidently fails to allow for two very significant factors. The first is that he has a daughter who loves him, who is herself grieving and who both needs the support of her father and who needs to give her support to him. Grief may often make people isolated, but it should not: it is something that should be shared. Wilcox’s famous line is not a prescription, but a sad observation: people can struggle to know how to help a grieving person so they keep their distance. But family and close friends are experiencing grief themselves, and one of the best things they can do is share it, weeping together, laughing about the good times, being together, valuing each other. But Max abandons her because he is so self-absorbed. Judging from the flashbacks to his time with Anna, he has been for a very long time. John Banville says, ‘When we’re children, we’re locked inside ourselves. We’re totally self-centred.’ But Max still is. In a very important sense, he has not really grown up. The second factor that Max fails to allow for is that going somewhere full of memories will make him more, not less, mindful of the past. Living in the past is clearly a tendency for Max anyway — he is an art historian (though whether that is a cause or a symptom is less obvious). Soon after he arrives at The Cedars, Miss Vavasour asks him why he has come back. He supposes that it is to escape, but she observes, ‘Fleeing one sadness by revisiting the scene of an old one. Doesn’t work.’ She is quite right, as Max soon discovers. He cannot leave his grief behind in Dublin, for he carries it within himself. And if he thinks that it will be easier to be away from a place that is full of memories of Anna, he has forgotten that memories can be prompted by the smallest of things, which superficially appear unrelated. Back in a place of happy memories of a fun-loving family, he is reminded that his marriage to a fun-loving wife had its tensions; in a place where he was first confronted with the horror of death, he cannot help but think about Anna’s premature departure from the world. Max increasingly flounders as the currents of his recollections sweep over him, and he soon sinks deeper into drunkenness and despair. Nevertheless, returning to the scene of intense childhood joys and pains does do something for him. Producer Luc Roeg says, ‘The Sea is a film about a man who reaches a point in his life when he has to go back and discover a time in his past that reveals himself. . . . It’s the unfolding of those events that unlock his present.’ They do so because Max finds himself compelled to re-examine the events of that far-off summer, perhaps for the first time as an adult. As he looks back, he sees that he was not the only self-centred person on the beach; the Graces may have enfolded him into their midst, but they were each intent on fulfilling their own desires and agendas, without a great deal of thought to others. It is not clear whether or not Max had carried some sense of guilt for the tragedy that unfolded, but as he calls to mind the turbulent relationships within the Grace family, and with the children’s nanny, Rose (Bonnie Wright), he eventually realises that he was essentially an onlooker: there were already strong currents at work. The memories remain powerful and painful, but there was little, if anything, he could have done. That is even more true in relation to Anna. At home in their kitchen after hearing the gloomy prognosis, Max expressed the wish that he could do something. Anna reacted scornfully: not only was there nothing to be done, but in her mind, Max was not someone who does things, but constantly operated in a passive, reactive mode. He is well aware of his failures and weaknesses, but when he reconsiders the two tragedies which have blighted his life, he finally accepts that they were not his fault. Shortly before he leaves The Cedars, he discusses the grieving process with Miss Vavasour. ‘You learn that the march of time is relentless,’ she says. ‘That helps.’ Things happen — sometimes within our control and sometimes not — and the world moves on regardless. Living in the past doesn’t help; eventually, in some way or other, one must continue on. The most fundamental problem for Max, though, is that he is a man grieving without hope. God is notably absent from this film. That is not at all to say that God should be present in every film, but the experience of death is one of those times in life when many people reflect on spiritual matters — even those who never give God a moment’s thought in less painful times. So the fact that neither Max nor Anna even bring the subject up is revealing — perhaps all the more because the setting is Ireland where religion remains a significant aspect of the culture. Max’s silence on the matter suggests that he has a thoroughly naturalistic view of human nature: we are born, if we are lucky we love for a time, we die, and that’s the end. Like sandcastles on the beach, we will all be swept away, leaving no lasting trace and finally forgotten. In the New Testament, Jesus Christ claims that it is possible to have a hopeful attitude even to death by virtue of his own death and resurrection, because that is what opens up for us the possibility of eternal life: ‘I am the resurrection and the life. Anyone who believes in me will live, even after dying. Everyone who lives in me and believes in me will never ever die’ (John 11:25). This wonderful possibility is not part of Max’s thinking, nor was it part of Anna’s, so he is left ‘without God and without hope’ (Ephesians 2:12). All he can do, then, is to continue on with time’s relentless march, finding what comfort and pleasure where he can until his sandcastle, too, is swept away. With no real hope for the future, perhaps living in the past is the best he can do.